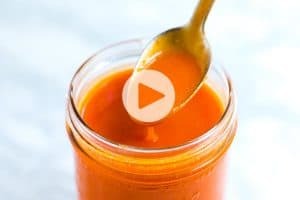 How to make homemade pumpkin puree from scratch to be used in your favorite pumpkin recipes. 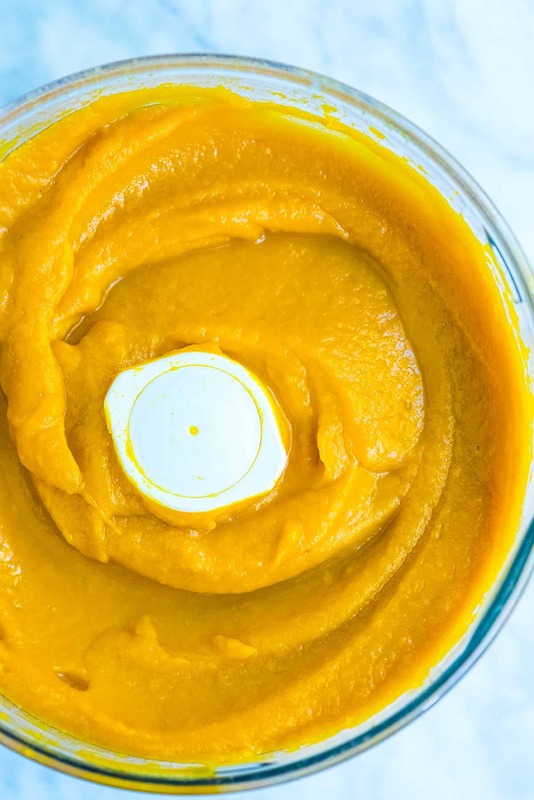 Jump to the Easy Pumpkin Puree Recipe or read on to see our tips for making it. 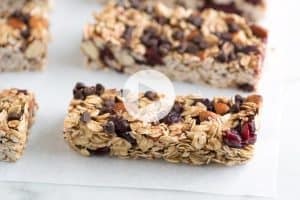 The recipe requires only two ingredients and that’s counting salt, which is technically optional! You are looking at 45 to 60 minutes of roasting time, but that’s really not too bad especially since it makes your home smell amazing. You want to use small baking pumpkins when making pumpkin puree. Look for signs that say “sugar pumpkin” or “pie pumpkin.” They just taste better than anything larger (especially your Jack-O-Lantern varieties. Leave those to the decorating). If you are at a farmer’s market, ask the farmer which pumpkin to get. They’ll know best. Once it’s home, give the pumpkin a good rinse then get to cutting it in half. It’s pretty easy, especially when you are using the smaller varieties. If the pumpkin doesn’t sit steady, slice a small bit away from the bottom so that it does. Then plunge a heavy knife into the top near the stem and push down to the bottom. Keep your fingers out of the way. I find that a dishtowel helps to keep the pumpkin from moving around on me. 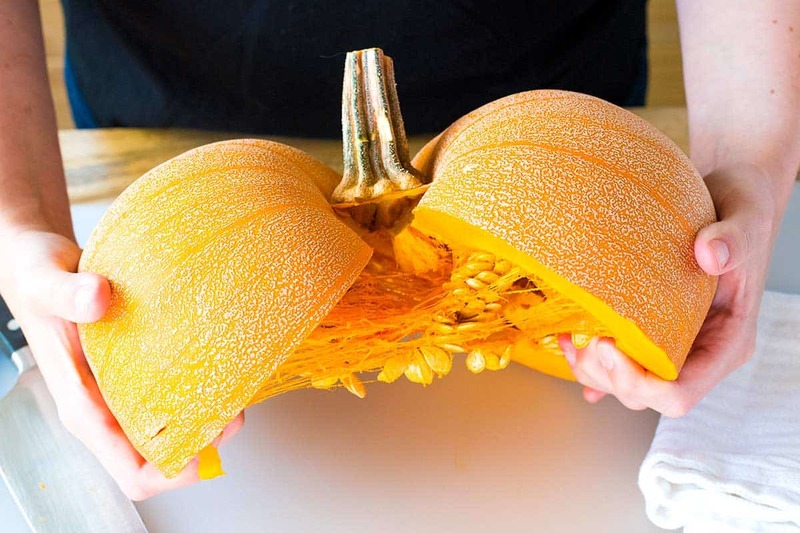 Rotate the pumpkin and make a cut from the stem to the bottom again. Wiggle the knife through the bottom so that all but the stem is cut. Don’t try to cut through the stem, it’s way too tough. Finally, pull the two halves apart. As you do this, the top of the pumpkin should break just under the stem and the stem can be pulled away. By the way, we use this cutting method for spaghetti squash and shared a video showing how we do it. And there you go. Scoop out the pumpkin seeds and any stringy flesh then lightly season with salt. Place the halves cut-side-down onto a baking sheet and roast until the flesh is soft and coming away from the skin. Once the pumpkin is roasted, throw the softened flesh into a food processor and blend until smooth. Easy! This recipe isn’t just for pumpkin. Think about swapping in other winter squashes like butternut or acorn. The roasting time might need to be adjusted slightly, but the method stays the same. 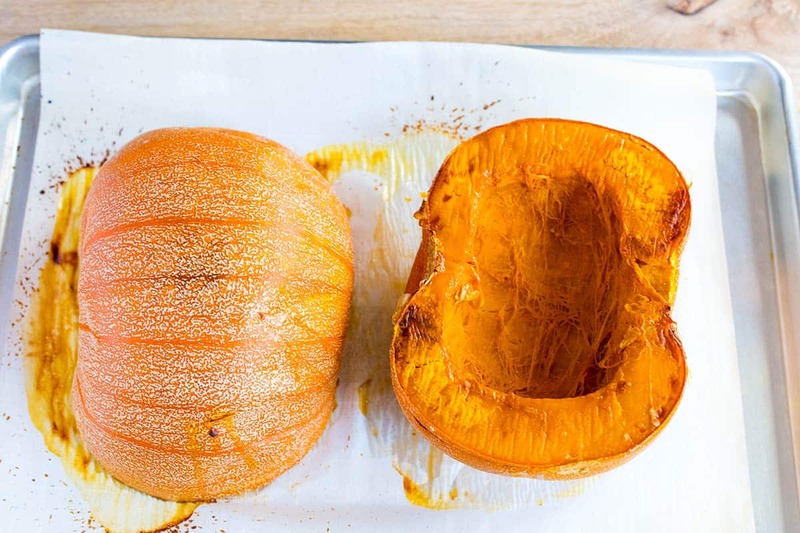 Simply roast until the squash can easily be pierced with a knife in several places. 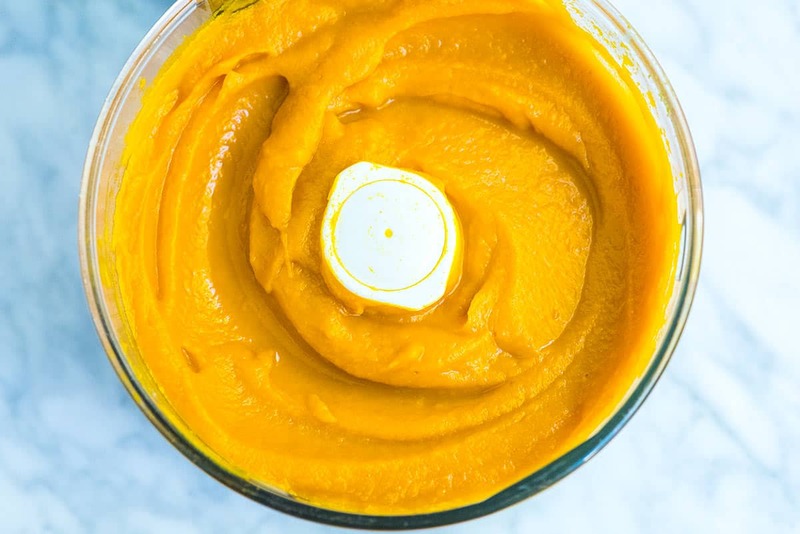 Use this homemade pumpkin puree for things like our Easy Pumpkin Mac and Cheese, Homemade Pumpkin Pancakes, your very own Pumpkin Spice Latte From Scratch and Pumpkin Pie. For more from scratch recipes, check out our Fail-Proof Homemade Mayonnaise, Ketchup From Scratch and Homemade Hummus that has so many reviews we can’t keep up. Skip the can and make your own pumpkin puree at home. It’s easy, smells incredible and works perfectly in your favorite pumpkin recipes. Look for baking pumpkins often labeled “sugar pumpkins” or “pie pumpkins”. There’s lots of variety so if you are buying directly from the farmers at farmer’s markets, ask them which pumpkin works best for your needs. This method works with most winter squashes — think butternut, acorn or interesting varieties like honeynut. Rinse and pat dry the pumpkin. Cut the squash from stem to end, but don’t try to cut through the stem (it’s too tough). When you’ve cut through the pumpkin, just pull each half apart. We do this in two parts. Cut one side from the stem down to the bottom of the pumpkin. Remove the knife, rotate the pumpkin to the opposite side then do the same. When there is a slit down both halves of the pumpkin, put down the knife and pull the halves apart. They should separate at the stem. Scoop out the seeds and most of the stringy bits. Lightly season the inside of the pumpkin halves with salt then place cut-side-down onto the baking sheet. Bake until the pumpkin can easily be pierced with a knife in several places and the flesh is pulling away from the skin, 45 to 60 minutes. 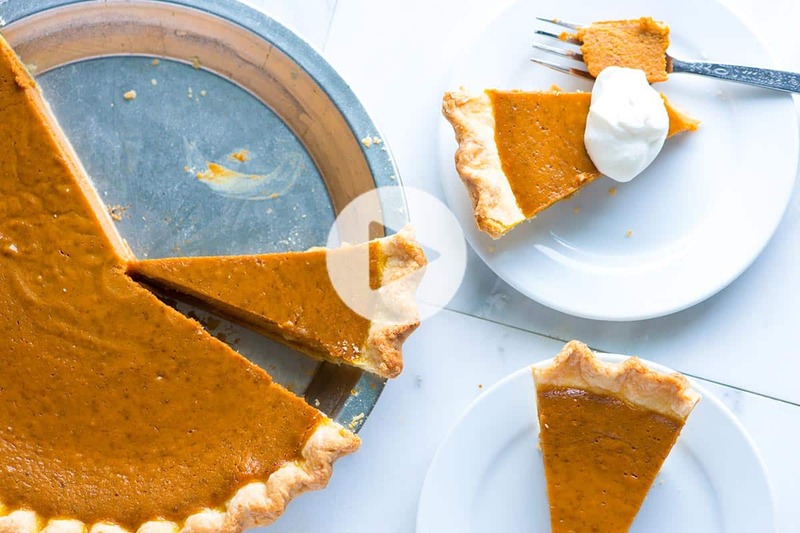 Cool until you can safely handle the halves then scoop out the soft flesh into a food processor — depending on how large the pumpkin is, you may need to do this in two batches. Process until very smooth, 3 to 5 minutes. Make-ahead: Store homemade pumpkin puree in food-safe containers in the fridge for up to 1 week or freeze for up to 3 months. 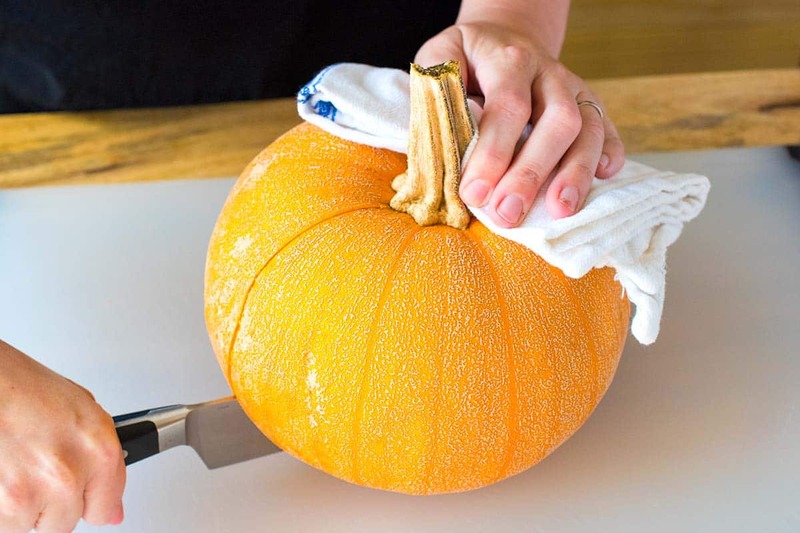 Before cutting in half, if the pumpkin doesn’t sit steady, slice a small bit away from the bottom so that it does. I’ve made pies from those “jack’o’lantern” pumpkins for years and they are just as tasty as any store bought pumpkin in my opinion! Do you ever drain the puréed pumpkin? Mine seemed to have a lot of liquid after I puréed it and it sat for a while in the refrigerator. Hi Denise, Since pumpkins do vary, some will produce a more moisture-heavy puree and others won’t. Draining is an option or you can throw it all into a saucepan and simmer to reduce the puree some. I found that roasting at 350 degrees until pierceable (takes longer but gives better texture for using in drinks) was better on older pie pumpkins in storage. I blend a half of a baked de-skinned sugar pumpkin with a can of evaporated milk. Makes a convenient pumpkin latte base, and keep the supply in the fridge. It’s a way to build the pumpkin content and character of many inspirations! There is no mention of what temperature to roast the pumpkin. 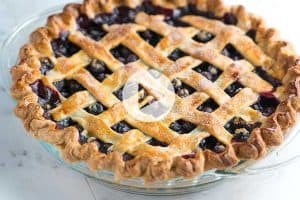 Hi Virginia, All the recipe details are above. We use a 400F oven and roast for 45 to 60 minutes. Hi, do we have to use a specific type of pumpkin? Can I use the “butternut” one ? When choosing the best pumpkin, go for a smaller one that is sold as a “pie pumpkin” or “sugar pumpkin” Larger carving pumpkins (like for Halloween) are not the best to use since they lack the flavor of the baking varieties. 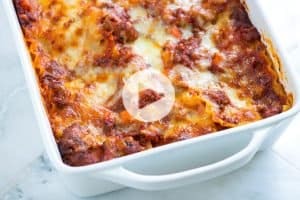 Butternut squash is also a great alternative.